Certified bio-organic complete wet food for adult dogs. 100% human-grade carefully selected ingredients of the highest quality from bio-organic farmers in Bavaria create this scientifically formulated single protein 100% natural and additive-free superfood for your best friend. Gently poached to preserve vital nutrients and vitamins, this unique recipe includes a high percentage of bio-organic chicken and turkey, including a fine balance of muscle meat and vital inner organs. Essential additional nutrients are provided through a carefully formulated mix of bio-organic vegetables and fruit, including zucchini, mango, pumpkin, blueberries and parsley, creating a balanced and delicate superfood with a compelling aroma and taste for discerning dogs. This recipe has been enhanced with fermented Jerusalem artichoke concentrate which has a highly beneficial pre-biotic effect to aid digestion and your dog’s ability to absorb the nutrients in this recipe, together with pharma grade salmon oil for crucial Omega 3 & 6 fatty acids for the benefit of your dog’s hair and skin. 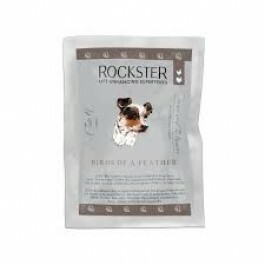 Birds of a Feather represents A Taste of Lake Como, and is inspired by The Rockster’s Journey. What is in Rockster Birds of a Feather? Ingredients:80.5% Bio-organic chicken and turkey (muscle meat, heart, gizzard, liver), 4% Bio-Zucchini, 4% Bio-Mango, 4% Bio-Pumpkin, 4% Bio-Blueberries, 2% Bio-Parsley, 1% Salmon oil (pharma grade), 0.5% Bio-Fermented Jerusalem artichoke concentrate. Naturally Derived Trace Elements per kg:Zinc (as Zinc sulphate monohydrate) 0.8 mg, Manganese (as Manganese-II-sulphate monohydrate) 0.3mg, Iodine (as Potassium iodite) 0.1 mg.